Team Qmaths had filed RTI regarding multiple queries raised by our followers to SSC HQ. Today on 19-01-2017 we received the RTI reply for the same. Below is the query and RTI reply received. 1) Pattern of SSC CGL 2016 Tier 3 descriptive paper regarding type and number of questions to be asked. 3) Number of candidates to be selected after Tier 2 for Tier 3. 4) Revised Answer key after representation used in SSC CGL 2016 Tier-1 of all Days and shift. 5) Number of candidates to be selected after Tier 3. 8) Number of candidates appearing in SSC CHSL 2015 Typing test. Reply :- Point No. 3 & 5 : No information is available with the CPIO. 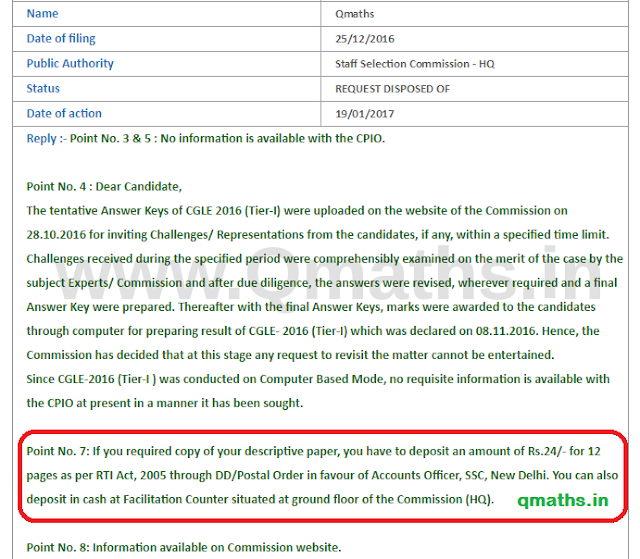 The tentative Answer Keys of CGLE 2016 (Tier-I) were uploaded on the website of the Commission on 28.10.2016 for inviting Challenges/ Representations from the candidates, if any, within a specified time limit. Challenges received during the specified period were comprehensibly examined on the merit of the case by the subject Experts/ Commission and after due diligence, the answers were revised, wherever required and a final Answer Key were prepared. Thereafter with the final Answer Keys, marks were awarded to the candidates through computer for preparing result of CGLE- 2016 (Tier-I) which was declared on 08.11.2016. Hence, the Commission has decided that at this stage any request to revisit the matter cannot be entertained. Since CGLE-2016 (Tier-I ) was conducted on Computer Based Mode, no requisite information is available with the CPIO at present in a manner it has been sought. Point No. 7: If you required copy of your descriptive paper, you have to deposit an amount of Rs.24/- for 12 pages as per RTI Act, 2005 through DD/Postal Order in favour of Accounts Officer, SSC, New Delhi. You can also deposit in cash at Facilitation Counter situated at ground floor of the Commission (HQ). Point No. 8: Information available on Commission website. Point 1. . Pl see information available on website under latest news under the title CGLE 2016 further elaboration. No additional information is available with CPIO. Point 2. revised dates are yet to be fixed. If you have some queries you may ask via comments, we'll file RTI regarding queries which will be useful for all.